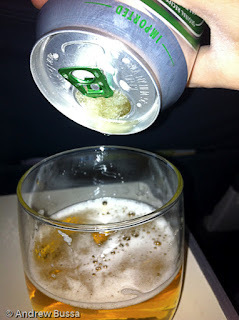 The Heineken Slushy is an off menu drink item for United Airlines first class customers. It's a frozen can of Heineken that comes out in a slushy consistency. United puts their beer on top of the ice in the catering carts and if the beer sits there long enough, you get a Heineken slushy. I've only had these as pre-departure drinks and only with Heineken. Some passengers may find it a nuisance, but I like the humor of it.